Flights to Rotorua can be a convoluted process at times. Especially when you look at flying in from destinations outside of the main centers. This has the added effect of making flights relatively expensive at times. Not quite what you want to hear is it? 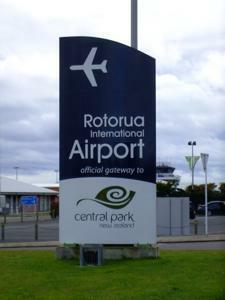 Daily domestic flights to Rotorua are carried out, in the main, by Air New Zealand. You can fly in from Auckland, Wellington, Christchurch and Queenstown via Christchurch. We do have one other service and that is Sunair (The Big, Little Airline), a small family owned aviation company based in Tauranga. Try them out if you're wanting to fly to/from Gisborne or Napier. It really pays to pick your times. For instance, school holidays bump the ticket prices up massively. Important Update: Boo. Air NZ has discontinued transtasman International flights. All I can say is it's a huge disappointment. I'll leave the original information as follows. If you don't want to read it, pop down the page to New Zealand's other International Airports. We have our own little International Airport too with flights both into and out of Sydney, Australia, twice a week. That is so cool because you fly straight into the heart of New Zealand tourism. What could be better? No battling big crowds to get into the country. No mucking around waiting like you do in the larger airports. If you are flying in it can take up to half an hour to go through processing. Flying out is even better because you can get through in 5mins. How's that? Even better again, it's only 9km and 10-15 minutes to the city centre depending on the traffic. You can be cosily tucked up at your accomodation within an hour of setting foot in the country. Great huh? Love it. When you fly out of Rotorua International Airport there are taxes to pay. Grrr, don't you just hate that? It's all for a good cause though. There is a Domestic Development Levy of $5.00 to pay. This goes towards the construction of new facilities at our airport. I suppose going international doesn't come cheap. In addition to this there is the normal International Departure Tax of $15.00. Breaking News 1/02/15 - Taxes have been discontinued so disregard. Whoopee. Duty Free shopping is available in Arrivals and Departures where you can stock up on your favourite perfumes, alcohol, cigarettes etc. There is also a Currency Exchange service, Internet Access, a Whitcoulls Book Shop and a Robert Harris Cafe. In fact, we have got everything the large airports have... on a smaller scale. If you are not using the Sydney ⇄ Rotorua flights, New Zealand has a choice of six other international airports. You need to be aware though that the majority have limited overseas destinations. I have noted the major connecting cities that apply to each airport. If you click each airport link you will be taken to the info pages on their websites, alternatively, find the best deals on TripAdvisor. Auckland Airport - This is our major international airport with worldwide connections. Wellington Airport - Brisbane, Melbourne, Sydney, Fiji. Christchurch Airport - Melbourne, Sydney, Brisbane, Gold Coast, Perth (seasonal), Nadi, Singapore, Bangkok, Tokyo (seasonal), Dubai. Queenstown Airport - Melbourne, Sydney, Gold Coast, Brisbane.